The JUENTAI JT-UV6DR is a compact hand held transceiver providing 4 watts in the frequency range of 136-174 MHz and 400-480 MHz. – The JUENTAI JT-UV6DR It is a compact, economical HT that includes a special VHF receive band from 65 – 108 MHz which includes the regular FM broadcast band. – JUENTAI JT-UV6DR Dual watch and dual reception is supported. 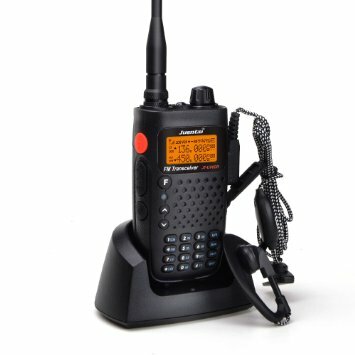 – JUENTAI JT-UV6DR Other features include: selectable wide/narrow, battery save function, VOX, DCS/CTCSS ,8groups scrambler ,DTMF encode, key lock and built in flashlight. – Selectable frequency steps include: 2.5, 5, 6.25, 10, 12.5 and 25 kHz. RF power may be selected at 5 or 1 watts. – This radio comes with BNC flexible antenna, JTB-6 Li-ion battery (7.4V 1500 mAh), belt clip, wrist strap, AC adapter (8.4V 600ma) and drop-in charging tray.